Collins Booksellers - The 2500 most Common Arabic Words by David Serge, 1230001596007. Buy this book online. 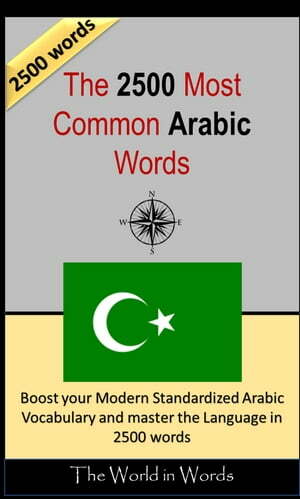 This book has been prepared to help you boost your MSA (Modern Standard Arabic) skills. Whether you prepare for an important exam, contemplate a move to an Arabic-speaking country, or simply wants to brush up your skills, we have selected the 2500 words that you will encounter the most often. Based on newspapers, books and verbal interactions, these words are indeed enough to understand about 70% of any material in Arabic you can put your hands on. While learning big volumes of vocabulary can be a daunting enterprise, we made sure to propose you with a simple and comprehensive way to do so. The words are indeed presented from the most common to the least common and all of them are translated in simple terms. We wish you an agreeable learning experience and great success in your learning.